Carnival weathered the Costa Concordia disaster well and its stock is still near a 52-month high; what will happen with bookings in the next six weeks will demonstrate how well the industry will manage this accident closer to home. Shareholders are anxious to see whether the mess on board a disabled Carnival cruise ship will hurt the broader industry. The 4,200 passengers on the were able to get off of the ship on Friday after it docked in Mobile, Ala. The ship lost power in an engine-room fire on Sunday. Carnival Corp. shares held onto their pre-fire values above $39 through Tuesday. By Wednesday, news reports of poor conditions on the ship began to get more attention, and its shares got as low as $37. They were at $37.23 in afternoon trading on Friday. The mess on board the ship was the worst publicity the cruise industry has had since the Costa Concordia — operated by a company owned by Carnival — capsized off the coast of Italy in January 2012, killing 32 people. A third Carnival ship, the Splendor, lost power in 2010 and was towed back to port under similar conditions to those on the Triumph. Goldman Sachs on Thursday reduced its 2013 earnings estimate for Carnival to $2.24 per share, from $2.32, reflecting guidance from Carnival management about the impact of the Triumph’s problems. The reduction just accounted for the lost income of taking the Triumph’s 2,750 berths out of action, and for repairing the ship. 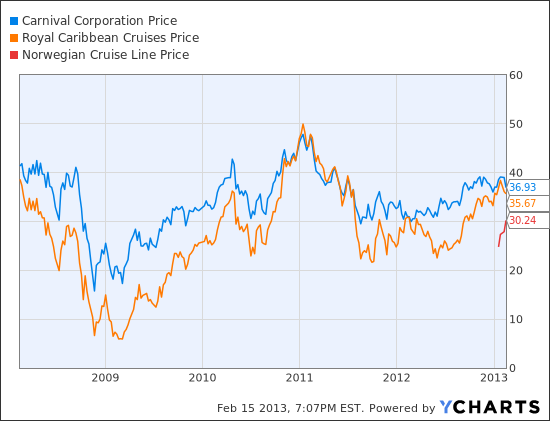 Goldman Sachs analyst Steven Kent wrote that Carnival yield growth could also be hurt by the bad publicity. Royal Caribbean Cruises Ltd. stock also fell Wednesday. After trading as high as $36.64 on Tuesday it was at $35.46 on Friday, down by 20 cents for the day. Norwegian Cruise Line shares have been rising this week after it reported quarterly results on Monday. They were up 53 cents to $29.78 on Friday.